Summer is our unrivaled favorite time of year to finesse our best natural beauty looks. Not only does the season bring about glowy, well-rested skin that makes us want to rock a bare face on the reg, but, for curly-haired girls, it also delivers those tousled-to-perfection waves only beach weather can seem to create. Sadly, we can't always be sunbathing with our toes in the sand (such is life), so we set out on a mission to master that just-out-of-the-ocean look in our very own bathrooms — with some help, of course, from our trusty Dyson Supersonic™ hair dryer. Just snap on the diffuser attachment, which will release evenly dispersed air to give hair that au naturale look. 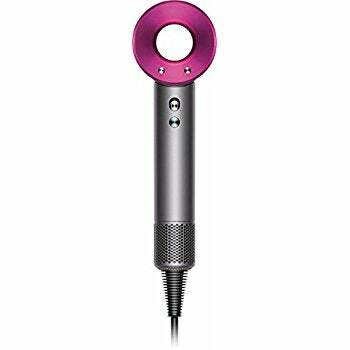 (Did we mention the hair dryer uses intelligent heat control to help prevent against extreme heat damage, too?) Simply follow the steps ahead to recreate these carefree curls, even when you're landlocked. Step 1. Mist a lightweight salt spray all over damp hair. Step 2. Divide hair into sections. Step 3. Using the diffuser attachment on your Dyson Supersonic™ — which is specially engineered to accelerate natural drying and help reduce expansion or frizz — dry sections of hair on the lowest airflow with low to medium heat. Work your way up from ends to roots and save your bangs for last. Step 4. Give your hair a quick flip and tousle with your fingers to reveal a perfectly undone look.